The car wash bucket you never knew existed! 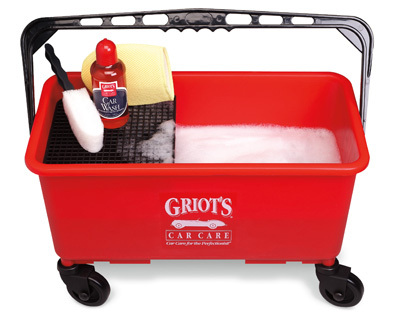 Griots Garage Ultimate Car Wash Bucket is proof that not all buckets are created equal. This masterpiece of thoughtful engineering is designed and constructed so well it almost doesn’t feel right calling it a bucket, something that is normally cheap and used for projects around the house. This must-have detailing accessory was designed from the ground up to be the hands-down ultimate car wash bucket, bar none. A lower grill allows heavy grit to sink to the bottom where it can't contaminate your Wash Mitt. 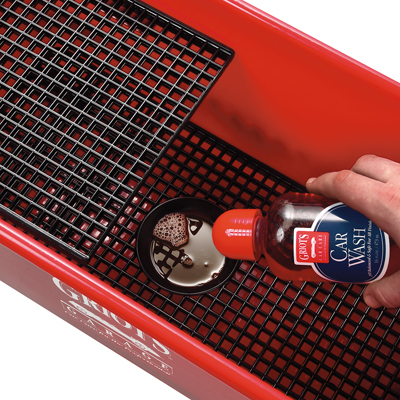 An upper grill holds your wash tools. Genius! Built-in measuring cup ensures you never use too much or too little Car Wash! Repeat after me: 6 gallons of water. No, that’s not a typo! 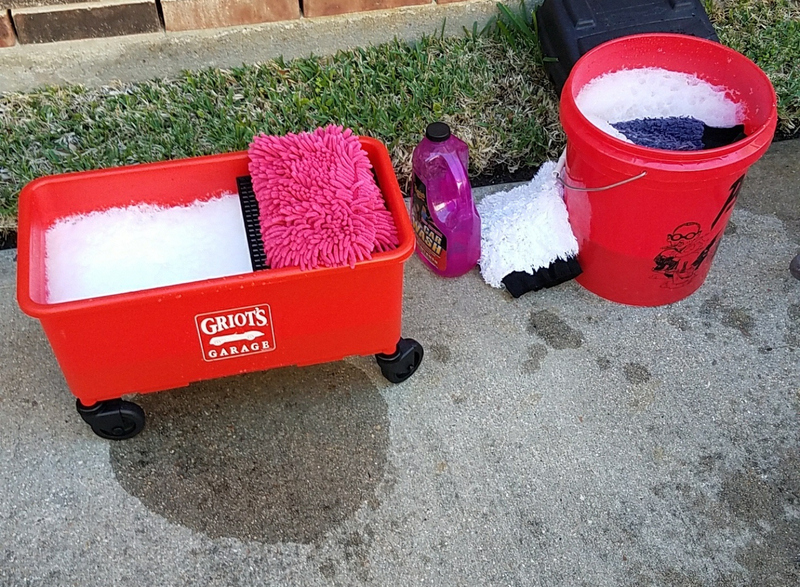 The Ultimate Car Wash Bucket by Griot’s Garage holds a massive 6 GALLONS of water! Never again will you have to reload your wash bucket with water and soap halfway through your routine wash. There are several reasons why the Ultimate Wash Bucket will quickly become your most valuable detailing tool. First and fore most, a lower grill allows heavy grit to sink to the bottom where it can't contaminate your Wash Mitt. An upper grill holds your wash tools. Last, but certainly not least, a molded-in measuring cup (patented design) allows you to dispense the perfect amount of Car Wash. Unbelievable! The Ultimate Wash Bucket sold at Autogeek is packaged with 2” casters to make it easy to roll around your driveway. We also include a snap-on lid, perfect for storing your supplies in the bucket after you wash the vehicle. The Ultimate Wash Bucket is 19” wide, 9” across and a generous 9” deep. It’s so big you can even use one of our Montana Boar’s Hair Car Wash Brushes with it! Griots Garage Car Wash 16 oz. Montana Original Boar's Hair Car Wash Brushes - On Sale! for your mit or wash pad. ProsEasy to move around, very handy features. I used the bucket and wash pad for the first time on a recent Sunday morning car wash therapy session. In use, the bucket is great. Finally, I can have a true 2 bucket wash of the car. Also noteworthy was the wash pad. It seemed to hold soap very well, more so than my existing mitts. ProsMeasuring cup molded into the lower grate is very handy. The upper shelf for your mitt is very helpful as well. Wheels make it really easy to move around. Might seem a lot of money for a wash bucket, but it's the best. Had mine for years, and it holds up to abuse. ProsGrit guard built in. Shelf for your wash mitt. Pre measured cup in bottom for your choice of car wash. Casters.